Automatic Oiling Thread Winding Machine has been newly researched into and developed by the company in 2009. It targets produce the colour difference upon uneven oiling inside the winding process of the traditional cone winder and thus reduces the yarn quality. This device can accord with the yarn speed to control oiling amount, fulfill even oiling inside and outside the coil and greatly increase the coil quality. In addition, it has independent silicon oil box (one addition is for about ten day`s use), oil pump, automatic circulation oiling system. When it automatically oils the box, the surplus silicon oil returns to silicon oil box through adjusting hole of oil box, therefore oil level always keeps the same. 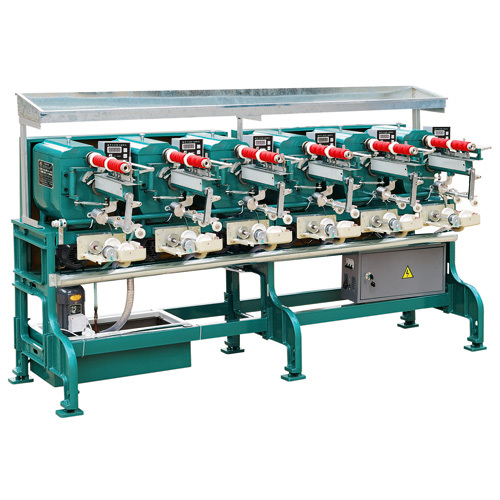 Looking for ideal Automatic Oiling Thread Winding Machine Manufacturer & supplier ? We have a wide selection at great prices to help you get creative. All the Auto Oiling Thread Winder Machinery are quality guaranteed. We are China Origin Factory of Auto Tracking Oiling Sewing Polyester Winder. If you have any question, please feel free to contact us.